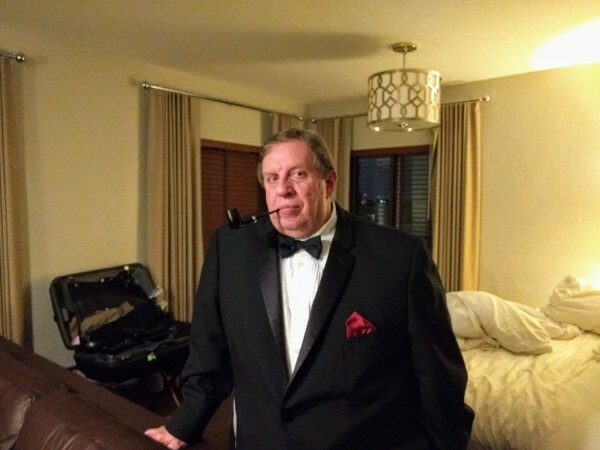 I wore my uniform when we were married and my wife has long lamented that she never saw me in a tux. I warned her that it would just be me, in a tux, and not James Bond. Nevertheless, I booked us into a romantic getaway and rented a tux. She has also insisted that I should get a Dress finish Dunhill as it would look appropriate with such attire. So here I am, on our anniversary, with the Dunhill she gave me as a present. This is why you stay married for 48 years! Photo not working.... but now.... FIXED! Thanks for the picture help! 48 year marriage? That's not something you hear about anymore. Congrats sir! Congratulations and you are looking, spiffy! Congrats to you and your lovely bride. You are looking very dapper. Congratulations on 48 years. I made it 36 years before mine left. Way to go...your a lucky man! Great achievement, you’re looking grand, Dec 11 I’m 53 yrs with the same woman. You look great on a most auspicious occasion, and congratulations. I bought a tux some years ago, imagining I don't know what. I eventually was able to wear it to a snazzy event my future wife invited me to, and that made it worth the trouble. Cufflinks, waistband gizmo, black tie and all, plus shoes. Some kind soul said together we looked like French aristocrats (???). Oh well, it's sometimes fun to get up in costumes. The duds were on a good discount. I was a widower at the time and looking for better times to come. I rented a tux marrying my late wife, when we were "kids" around thirty. This is very sweet. Love the pipe– you look good! No telling what makes some couples last and so many not. I'd guess it begins with some understanding of ones self on each side, to allow understanding someone else. Maybe managing anger and depression as they arise, in everyone. And like grace ... or something from outside us that permits a real bond. Commendations to you both. The tux and pipe look nice. Had a young man (21 years old) just ask me how long it took for me to know I had found the right woman for life. I told him we've been married for 43 years and I'm still trying to figure it out. I love everything about this post, @lraisch! Wonderful heartwarming story. Good on ya. A gentleman in a dinner jacket with a dress pipe- all too rare these days. You look quite nice in a Tux and the pipe is too die for.